Blogger freebies: Will brands be held responsible for rogue bloggers? Free product samples were once one of the few perks of being a blogger. But with a federal investigation closing in, corporate giveaways may be a thing of the past. free products from corporations. In June, the FTC announced new guidelines that would fine bloggers and corporations linked to them when writers do not admit to receiving payment for reviews and products they write about. brands disclose their relationship to sponsored review sites. But what they don’t touch upon is the extent to which brands will be held responsible for other people’s actions. Inc. and Urban Nutrition need to be clearer about sponsorships and disclosure. Both companies created websites that appeared to be editorial but were actually sponsored by the companies and made claims about their products and their competitors that were not fully backed by science. Urban Nutrition is happy to comply with the guidelines, but beyond simple disclosure, ERSP wants comments on each page of a website and thorough disclosure beyond any doubt for readers. That’s one thing for a company sponsored website, but what happens in other media? And when the company is not directly responsible for the copy? That’s when this will get interesting. blogger should disclose that he received the game free. Many journalists receive free review products all the time. The problem is that readers may not assume that individual bloggers have the same sort of connections. There’s nothing wrong with disclosing this sort of thing, but in certain media it gets difficult. Where in a 140 character tweet do you fit a disclaimer, for instance? Meanwhile, bloggers are not held to the same standards as journalists. Nor should they be. And regulating the blogosphere gets particularly thorny. In June, the FTC noted that both corporations and individual bloggers could get fined for violations about disclosure. But if bloggers want to ignore the rules, should brands be held responsible? If companies want to be generous with their products because they are confident that they will be met with enthusiasm, they should not be punished. If they are paying for positive reviews, that’s another thing. But both shouldn’t fall under the same rubric and figuring out how to monitor the gray area will be tricky. For a company that makes the bulk of its revenues from advertising, Google is particularly shy about advertising itself. 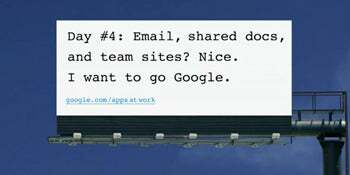 But starting today, the search giant is launching an offline campaign gunning for Microsoft’s office applications business. Not only is Google going after Microsoft customers where they are, the company is embracing a variety of low tech methods to do so. A major inhibitor to video revenues online so far has been audience size. Despite advances in the quality, quantity and length of videos on the web, most people aren’t watching them. To date, 99% of all video viewing is still happening in front of television sets. The company has long been working to distribute its content across as many platforms as possible. And today’s announcement marks a big jump in the size of the company’s footprint. That strategy is the key to the success of blip — and the online video marketplace. As newspapers struggle to turn a profit in the digital economy, the Wall Street Journal has had one small advantage in the battle for monetization: people don’t mind subscribing for their content. But The Journal isn’t expecting that to be a sulver bullet long term strategy. Like every other print publication, they are looking beyond ad dollars and subscription fees to make money. And their newest attempt is a business focused social network. In 2007, there were rumors that News Corp. was trying to buy resume building social network LinkedIn and now it looks like the company is looking to go it alone.